Kagan McLeod is from Toronto, Canada, and has enjoyed illustrating for newspapers, magazines and design firms since 1999. He has received awards for his work from such groups as the Society of Newspaper Design, the Society of Illustrators of Los Angeles, American Illustration and the Society of Publication Designers. He recommends The Master of the Flying Guillotine and Boxer's Omen wholeheartedly. 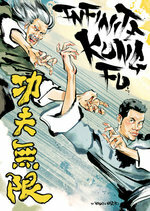 His graphic novel Infinite Kung Fu was released from Top Shelf in 2011 and racked up praise from every corner.